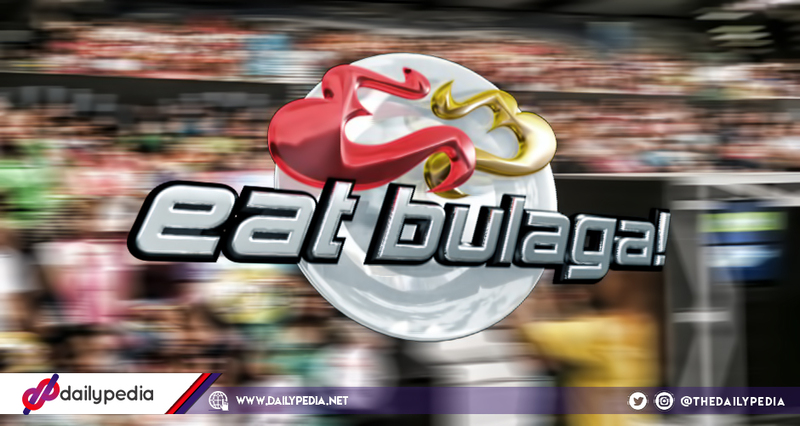 Netizens called out Eat Bulaga hosts for poking fun at domestic violence. Twitter users expressed their disappointment regarding the jokes made in the ‘Juan For All, All For Juan’ segment. Domestic violence is a serious global issue. Women mostly suffer from abuse everyday and there are times that they can’t do anything about it. 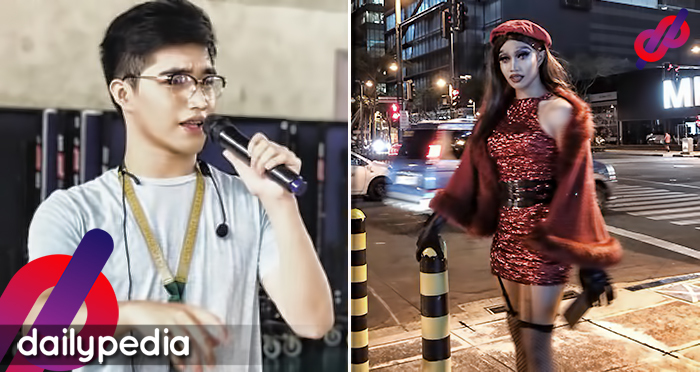 This is why an episode of noontime show Eat Bulaga sparked outrage from netizens. 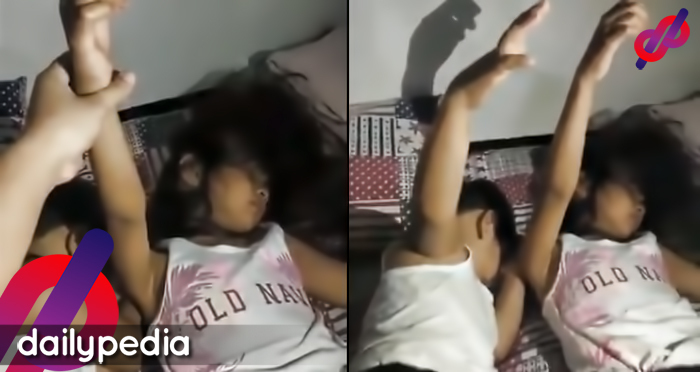 According to a post by Facebook user Carl Kenneth Jaronay, he was watching the August 30, 2018 episode of the show’s Juan For All, All For Juan segment when he suddenly grew uncomfortable. The hosts of the segment were said to be making jokes out of domestic violence. I’m watching Eat Bulaga and I suddenly grew uncomfortable watching the ‘All for Juan, Juan for All’ segment. The segment hosts are yet again making fun of a sensitive topic – this time, domestic violence. He went though the moments in the segment wherein the hosts questioned a woman’s lifestyle as she’s living a more comfortable life than other ‘Sugod Bahay‘ winners. She then admitted to having two daughters with different fathers. 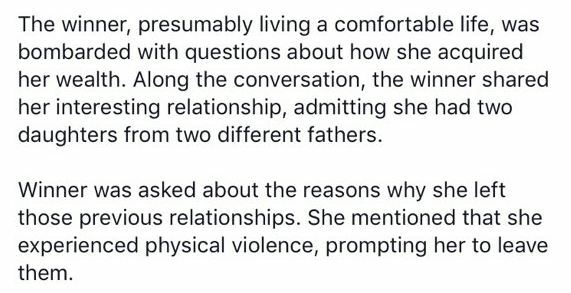 She added that the reason behind her decision to leave the men is physical violence. The winner, presumably living a comfortable life, was bombarded with questions about how she acquired her wealth. Along the conversion, the winner shared her interesting relationship, admitting she had two daughters from two different fathers. Winner was asked about the reasons why she left those previous relationships. 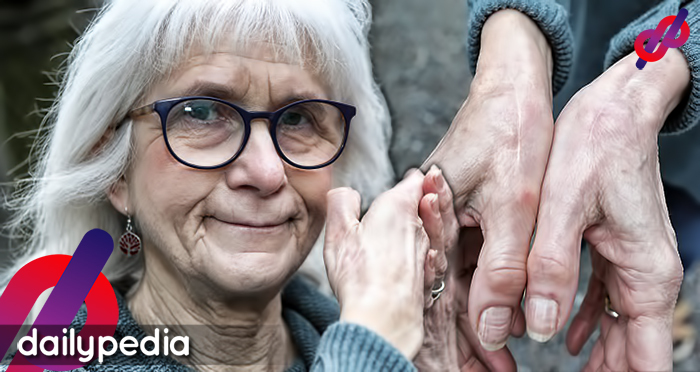 She mentioned that she experienced physical violence, prompting her to leave them. Jose Manalo joked about the situation and told her that maybe she nags too much which is maybe why her previous partners hit her. Jaronay then said hat it is not appropriate to joke about such a sensitive topic. 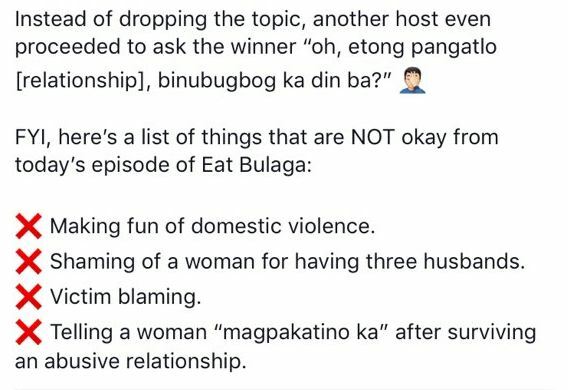 I don’t know about the hosts of Eat Bulaga but it’s NEVER right to make fun of domestic violence. Women in our country have long suffered from the issue and it’s inappropriate and insensitive to poke fun at such a sensitive topic. It did not end there as they jokingly asked if her third partner also abused her. The netizen then listed down all the factors that were wrong with the particular episode. – Making fun of domestic violence. – Shaming of a woman for having three husbands. 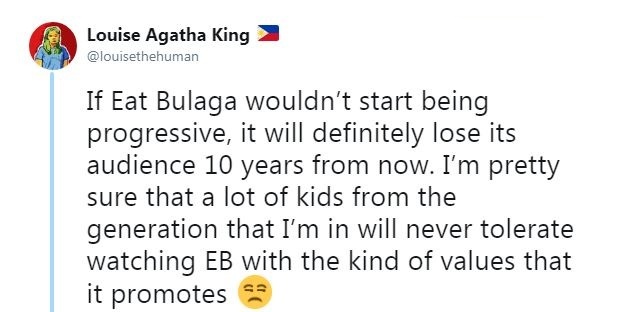 Twitter user Louise Agatha King shared the post on her profile, saying that if Eat Bulaga won’t change their ways, they will lose their viewers. 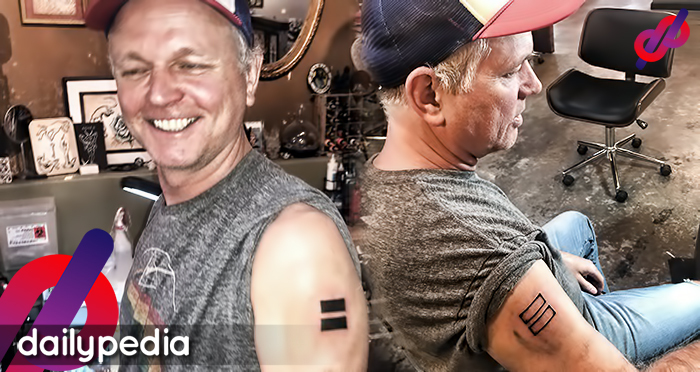 If Eat Bulaga wouldn’t start being progressive, it will definitely lose its audience 10 years from now. I’m pretty sure that a lot of kids from the generation that I’m in will never tolerate watching EB with the kind of values that it promotes. Netizens shared their reactions regarding the incident. Gillian said that the show makes use of the people’s situations for money and ratings. EAT BULAGA is a total garbage. For the longest time their program exploited the suffering of their contestants in return for money and ratings. Kadiri. @collisionc0rse shared another incident wherein the hosts encountered a lesbian couple. @Nhielskie12 said that a “perfect” show in the country doesn’t really exist. To be honest, wala naman ng naging perfect na show sa Pinas lahat may kritiko. Manuod ka sa Showtime kesho nilalait daw yung mga audience, pag nanuod ka naman sa Eat Bulaga ganun din ang comment sa hosts.. wala naman perfect na show lahat nalang napuna ng Pinoy. @MissPinkGirl234 expressed that as long as there’s someone joking about such a sensitive matter, people will not take it seriously. Hangaang may magbibiro at nagbibiro sa mga seryosong isyu katulad ng domestic violence, maraming mag-iisip na okey lang gumawa ng biro sa ganitong mga bagay. Nakakahiya. 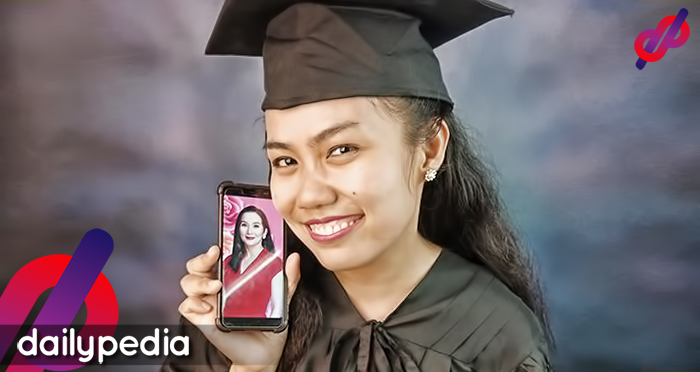 MARAMI NANONOOD SA KANILA! Hindi ba sila nag-iisip?? @LinneaHerself stated how people behind the show encourage such a behavior. But some of the people in Eat Bulaga are trash though. And they encourage this behaviour. Just look at Tito Sotto. I know he’s made a joke about single moms a while back. But the “masa” will tolerate this. Why? They “help” the poor. Money in exchange for dignity, sadly. TAGS: @collisionc0rse, @LinneaHerself, @MissPinkGirl234, @Nhielskie12, all for juan juan for all, Carl Kenneth Jaronay, eat bulaga, Eat Bulaga Domestic Violence, GMA Network, Jose Manalo, Louise Agatha King, Sugod Bahay, TAPE Inc.